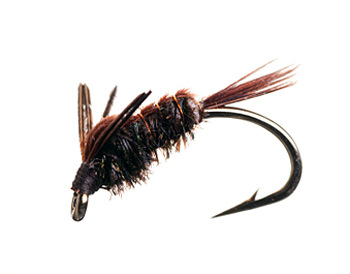 Question: A lot of fly patterns that are touted as “new” look like mere tweaks of established patterns. How do fly companies determine what’s actually worthy of being called a “new” pattern? Answer: I’ve often wondered about this myself, so I contacted my friend Shawn Brillon, Product Development Specialist in charge of flies at Orvis, to see what he had to say. Here’s his bracingly honest response: “Typically, determining if a pattern is worthy of being called ‘new’ requires a ton of research, looking at past patterns to compare similarities or differences to the pattern in question. Lets be honest, here. Very few patterns are truly new, by which I mean they are not modifications or versions of a previous pattern. I would consider the Gummy Minnow totally new to the fly market when it hit the scene, although a die-hard striper angler might argue that it is nothing more than a fly-rod-size Slug-Go. The Crease Fly would be another example of something innovative and new at its time. I look for innovation—in tying techniques, new materials, new hook shapes, and the like—as my guide to determining whether something can be called ‘new.’ There are no hard-and-fast rules that I use to make my selection other than to search for proven patterns, looking mostly at flies developed by our vast Orvis-endorsed-guide base. We look for patterns that have proven themselves on the water. But companies that sell flies are also looking for patterns that will do just that—sell. When we pull together an assortment offering for the year, I’m not necessarily on a quest to find a patterns that are new to the world, as much as I’m trying to find flies that are new to Orvis, to address a market need.